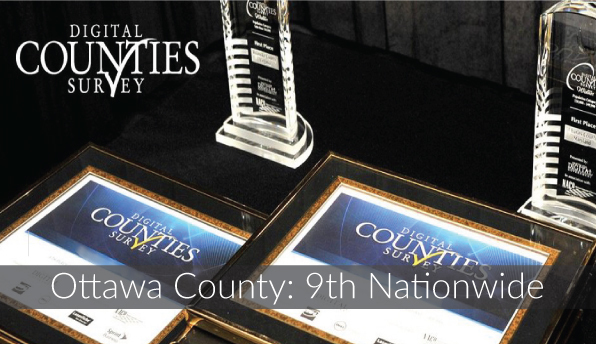 The Center for Digital Government and the National Association of Counties announced the winners of the 15th annual Digital Counties Survey. Ottawa County, Michigan was named 9th in the nation compared to counties with populations from 250,000 - 499,000. The survey identifies the best technology practices among U.S. counties, including initiatives that streamline delivery of government services, encourage collaboration and shared services, enhance cyber security and even reduce carbon emissions. “It is an honor to be recognized nationally. Offering a secure website robust in services is simply good customer service. Citizens can access permits, records, and other needs 24-7 without leaving home. It is efficient for citizens and the County." said Shannon Felgner, Ottawa County’s Communication Manager. Citizens in Ottawa County are actively visiting miOttawa.org for those online services. By the close of business on June 30, Ottawa County topped the ten million dollar mark in total transactions conducted via miOttawa.org. Its first e-service was property tax searches beginning in December of 2005. Along with services, residents can stay connected through technology. Ottawa County added email subscription services in 2015 as a way to push information to residents. To date, 26,000 people are subscribed to receive county news via email. "Though we have consistently been recognized for having a top website, we are never finished. We continue to grow our online services, increase transparency and work in creative ways using technology. Our website is always a work in progress. A new design with improved functionality and accessibility is scheduled in the coming months," Felgner added. Other Michigan Counties making the top ten list in their population categories include Oakland County, Jackson County, and Allegan County. See all the winners and their rankings. Over 1100 Ottawa County employees work together and achieve this through their commitment to excellent, cost-effective public services. For more information, visit miOttawa.org.